Updates for 2017: Grilled pork tenderloin continues to be a favorite with my family so I have a lot of these under my belt at this point. Updating this recipe to reflect my new recommendation for doneness temperature. I prefer to remove the meat from the grill once the internal temperature at the middle of the pork tenderloin hits 140 degrees. Drape a sheet of aluminum foil over to let rest for about 10 minutes and you should have close to a perfect 145 degrees once you start carving the meat. Pork, the other white meat. That's a slogan we all have heard a million times on commercials. I'll tell you what though, in my eyes a perfectly grilled pork tenderloin is the ONLY white meat I need. In reality, I love most cuts of pork. I love to get messy with some grilled baby back ribs, love to get sauce all over my shirt while eating a pulled pork sandwich and it's hard to beat a simple grilled pork chop. So I guess you can say I am big on the pig, but to me the pork tenderloin offers the most potential. This cut of pork is the most healthy cut of pork. Cut from the back of the pig, it has virtually no fat. This fact also makes it easy to dry out, for that reason we really need to focus on technique, grill it hot and grill it fast to lock in the juices. Tenderloins also absorb marinades really well so for this recipe, we are going to marinade our pork tenderloin just to give it a little more flavor. Let's take a look. 1Pay attention, there aren't many steps involved in producing the best grilled pork tenderloin. This piece of meat is so tender, it doesn't need a lot of help! Mix all of the marinade ingredients together and pour into a large Ziplock type bag. Place the tenderloins in the bag and squeeze out as much air as possible before sealing. Place the bag in the refrigerator and marinade for at least an hour, up to 24 hours. 2Remove the tenderloins from the marinade about 30 minutes before you are ready to grill and allow to gently warm up on the counter. 3Heat the grill to medium-high heat. 4Now we have a tenderloin that has been soaked in some great flavors, we need to make sure we don't screw it up on the grill! The key to properly grilling a pork tenderloin is to evenly cook the pork through by grilling each of the four sides. This cut of pork is tubular, so we want to roll it to each of the four sides while we grill. 5Once the grill is heated, place the tenderloin on the grill and grill the first side for around 5 minutes (times vary per grill, you are looking for a nice crust to form like shown in the photo, but not too much charring!). 6After 5 minutes, roll the tenderloin onto the the next side and grill for another 5 minutes. 7You know the drill now, 5 minutes per side, until an instant thermometer reads around 140 degrees at the middle of the pork tenderloin. 8Allow the grilled pork tenderloin to rest on a platter for about 10 minutes covered loosely with a piece of aluminum foil before you slice into it. The rest period should get the temperature to just barely a perfect 145 degrees. 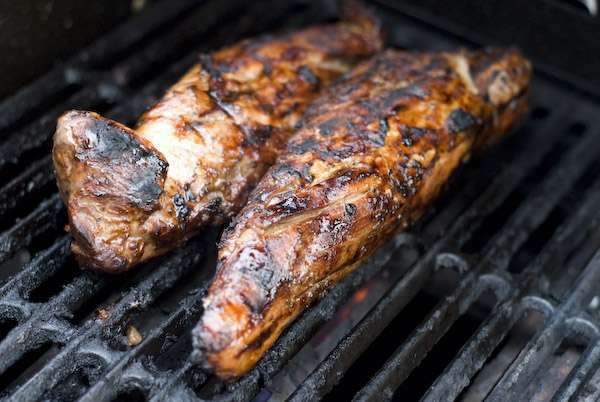 Grilled pork tenderloin is an awesome, lean cut of pork. If you don't have time to marinade, no sweat, it will be delicious with some Kosher salt and black pepper. The key is to grill it properly, over high heat and turning often to get a nice caramelized crust without drying out the pork. If you do have the time though, try it marinated, it's well worth the wait! Thus recipe is a family favorite for us. I’ve been making it fir for several years, and everyone loves it! At last…I’m a middle age backyard BBQ amateur, been looking for the perfect pork tenderloin recipe for years and I’m done searching. I was a bit suspicious but it taste just right. SO GOOD! I have made this several times and have used various weights of meat and it may need to cook longer the bigger the tenderloin, but always worth it! Definitely a keeper! I have made this multiple times and everyone loves it. Even picky grand kids 3 and 5 . They even requested it this Friday for dinner………Everyone who’s had it has to have the recipe. And it is so simple to make. Had this recipe for first-time. It was absolutely amazing. Thanks, will definitely have it again. I added a teaspoon of sesame oil. Delish. Absolutely delicious. My in laws who usually season with only salt and pepper loved it. And I agree with the other posters to remove the tenderloin from the grill at 140 and wrap it in foil for 10+ minutes prior to slicing. It was just a tad dry at 150. Great marinade. This pork tenderloin turned out great with a terrific char and flavor. A must try. Grilling instructions really helped me a lot. As far as marinade, i cheated using McCormick grill mates brown sugar bourbon 30 minute marinade. However, I let marinade little over 8 hours. Maybe the best pork tenderloin I’ve ever eaten! No one believed I produced such a masterpiece. Going to try it tomorrow. My first grill of the season. It looks so easy – my kind of recipe. Marinade is great! I did it sousvide at 140 for 4 hours, then finished on the grill. Amazing! I marinated this for just over an hour, and I can’t believe how juicy and delicious this was. And so easy! The whole family loved it. Definite keeper. Just simply excellent. My new “go to” recipe for pork. Butterfly it and baste frequently. 6-7 minutes on a side. I’ve been grilling for a lot of years but I must say this is the absolute best recipe for pork loin I have ever used. I have received more complements on this than any other pork recipe . Must say. This marinate is perfect for pork. It was a huge success. Also like to add if you make a batch and don’t use it to marinate the meat boil it up and use it as a nice glaze over the cut portions. Wonderful recipe, I added a bit more brown sugar and cooked it on the grill using a rotisserie and it turned out absolutely awesome!!! So easy, so delicious, enough said! Slice real thin put on white bread!! OMG ?????? I made this last night and it was delicious!! I did add some brown sugar to the marinade and OMG – this was a great tenderloin. Even my picky husband who wants everything PLAIN (God forbid there is any flavor to his food!) loved this! We loved it. Cooked it on the Big Green Eg until 140 temp, turning every 2 minutes. this recipe is so easy so awesome. The flavor is simple and superb, and the grilling instructions are excellent. I don’t know if I ever will make it different, although I am considering some rosemary in the marinade. The only thing I do a bit different is I simmer the marinade for 30-60 sec to soften the garlic. And the longer you marinade, the better. My family loves this. Delicious! Everyone loved it. Best marinade! Delicious!!! Everyone loved it! Best marinade! This is my go-to pork tenderloin recipe. It is always a favorite of anybody we grill for. This recipe has become my go-to recipe when i want to grill pork tenderloin. It is excellent and I always get compliments on the marinade. I do try to marinate it overnight or at least all day. A real winner! Had to leave a comment because it was bothering me that there was only one other review. This is a must try recipe. great stuff…but, just wondering, what’s the difference between this recipe and brining, this one is in direct heat, for 15m, as opposed to your brining recipe that calls to cook indirect for an hour… what’s the taste difference? I’ll have to try both, I am sure… but just wondering what the different techniques, bring to the table?